Hokuli‘a is one of my favorite Big Island subdivisions – and that’s saying something with the many beautiful luxury resorts we are blessed with here. Located in South Kona with mesmerizing views of the Pacific Ocean, Hokuli‘a has a lot to offer. For starters, the area is absolutely beautiful. Spanning 1,550 acres across three miles of Kona coastline from sea level to the 1,250-foot elevation, the luxury subdivision is quiet and private, yet is in close proximity to Kailua-Kona, the largest town in West Hawaii. With most homes situated at a little higher elevation, the temperatures are cooler and balmy trade winds keep things comfortable. Lots within this West Hawaii subdivision are a minimum of an acre, giving you a feel of estate properties. 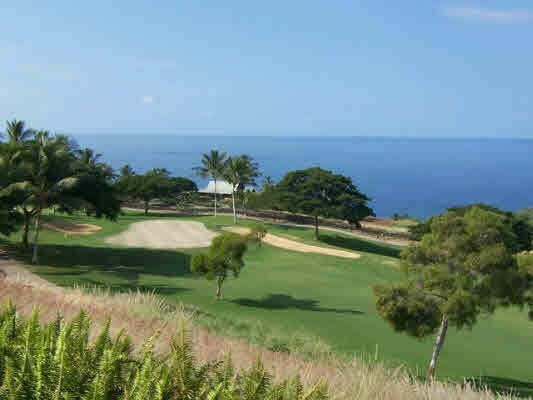 There’s also exceptional golf at Hokuli‘a with the 18-hole “Club at Hokuli‘a” course featuring 7,335 yards of golf on a course designed by Jack Nicklaus. Properties in Hokuli’a provide stunning Kona coast views; you can see the Pavilion, a community gather spot and restaurant in the distance. As for amenities, Hokuli‘a also features the lovely Pavilion, a restaurant and meeting place with beautiful views of the Pacific Ocean. I’ve noticed that more and more people are buying lots in the subdivision, which is in a growth period. One of the recent sales in Hokuli‘a includes my listing at 81-6623 Hiaaiono Place. The 5 bedroom, 5.5 bathroom unfinished house features 5,393 square feet of living space on 1.28 acres. Located within Phase One of Hokuli‘a, the property features Hawaiian pavilions, an infinity edge pool, and hand carved stonework. Among the home’s many unique design details are Balinese ironwood dragon scale shingles. The property, which was under construction at the time of the sale, was sold via short sale. This provided a great opportunity for someone to add their own finishing touches without having to go through the entire building process while also providing the buyer with excellent value. Understandably, the new owner is very excited and intends to finish the house for the use of his family. The property sold for $1,050,000 (cash), which was 70% of its asking price of $1,500,000. In the coming months I expect to see more sales completed in Hokuli‘a given the area’s natural beauty and proximity to shopping and dining in Kailua-Kona. Give me a call today at (808) 963-6880 to learn more about properties in Hokuli‘a and West Hawaii luxury estates.